The annual list of most violent cities in the world has been released, and Baltimore is again in it. While St. Louis took the top spot for American cities, and 15th overall, Baltimore was not far behind in 19th place. The report was published by a Mexican violence “observatory,” an office within a violence prevention organization. The “Citizen Council for Public Safety and Penal Justice” operates out of Mexico City and uses very sound methodology to make a determination of the ranking of these cities. They use published media reports, independent tracking of cases, and official estimates to come up with the list. Caracas, Venezuela, is now the most violent city in the world. 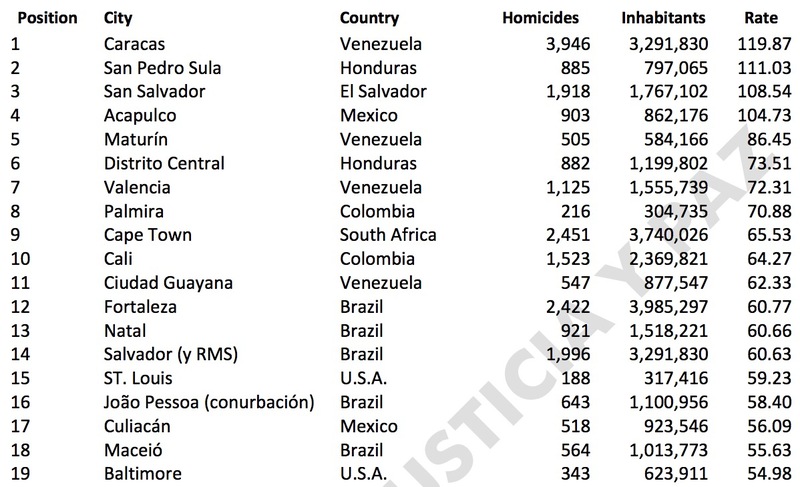 41 of the 50 most violent cities are in Latin America. 5 of the 50 cities are in Mexico. Medellin, Colombia, and Juarez, Mexico, are not on the list for 2015.